SJ Fisher Construction has worked on a wide variety of commercial remodeling or new construction projects. We have the flexibility to work with any size business on any size project. 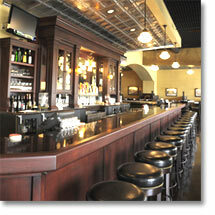 The Gold Nugget Restaurant has the look and feel of an old fashioned bar and restaurant in a modern day space. With beautiful dark brown wood, antique ceiling tiles, stained glass windows and copper corbel accents, the restaurant was created in an unfinished space in the lower level of an apartment complex. Due to an extremely tight time frame, SJ Fisher Construction completed the project within three months to meet an opening night deadline.